In my last post, I showed some of my drawings that were inspired by stories. Now I’m back again to pictures that seem to have been inspired by stories, but the stories are missing and never really existed. 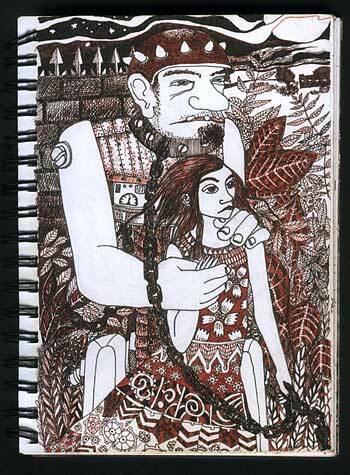 Here are some more pages from my sketchbook.This one has something to do with an escape. I believe the man-robot is a guard who has set the girl free, and become a voluntary slave himself. At least, that is what was bubbling around in my head while I was drawing it. 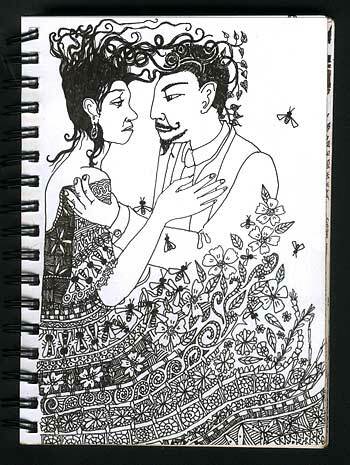 And here is another couple – certainly lovers. The man seemed to me to be worldly wise and quite cynical, but he also yearns to be as straight forward and innocent as the woman. She is a survivor, but I think she is unaware of her power.